Once in a storytelling career, if one is very lucky, a character like John Bassett III comes along. JBIII is brash. He is inspirational. He’s a sawdust-covered good-old boy from rural Virginia, a larger-than-life rule-breaker who for more than a decade has stood almost single-handedly against the outflow of furniture jobs from America. I first wrote a feature on him for The Roanoke Times as part of a series on the impact of globalization in southside and southwest Virginia. More than 19,000 textile and furniture factory workers lost their jobs in Henry County and Martinsville, but two hours away in Galax, John Bassett fought back to keep his 700 factory workers employed. 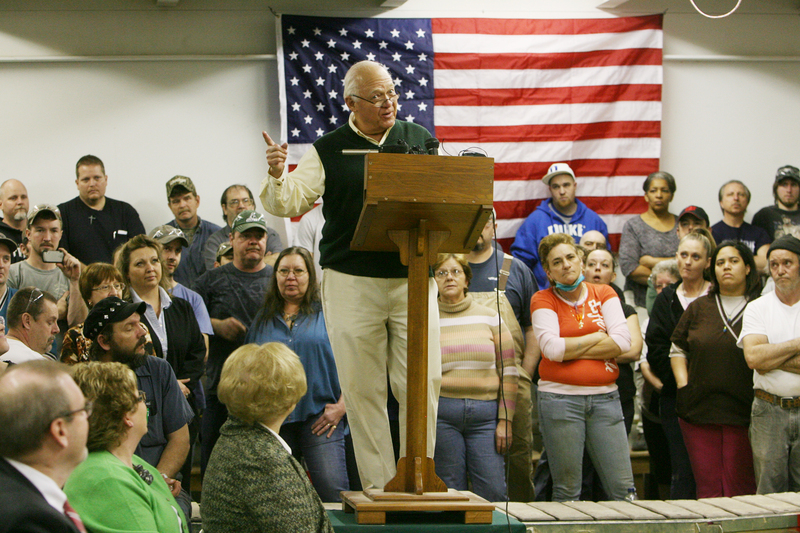 “Factory Man” is the patriotic story of a family legacy, a relentless work ethic that includes 1 a.m. phone calls to factory managers and remarkable grit. As my agent likes to call it, this book is “Moneyball” — with furniture. It’s the book you can give to your mom, and she’ll understand, finally, why it is that the once-thriving little factory town she grew up in looks the way it does now. Click here to see a video of the Factory Man himself, produced by Ryan Loew. So I’ve written a book called “Factory Man: How One Furniture Maker Battled Offshoring, Stayed Local — and Helped Save an American Town,” published by Little, Brown & Co. will publish in July of 2014. Columbia and Harvard journalism programs awarded it the J. Anthony Lukas Work-in-Progress prize last year, and the reviews were astonishingly good. For the latest in FACTORY MAN news, please “like” my Facebook author page. Still making it in America from The Roanoke Times on Vimeo. • No. 15 on IndieBound nonfiction list. • NYT critic Janet Maslin placed it at the top of her Best Books of 2014 Top Ten list. • Named as one of the 100 New York Times Notable Books of 2014. • No. 2 on Christian Science Monitor‘s Best Books of 2014. • Included on Publishers Weekly’s Best 20 Books of 2014. • Kirkus Reviews named it one of its Best Nonfiction Books of 2014. • Southern Independent Booksellers Association gave it the 2015 award for best nonfiction book. • Vulture, “7 Books You Need to Read This July“: Macy’s first book, ostensibly the story of John D. Bassett III — furniture heir, Virginia good old boy, and unlikely savior of domestic manufacturing — is better thought of as an Appalachian Random Family. In the course of narrating Bassett’s efforts to fight China’s underhanded underpricing, Macy digs in all directions, visiting company towns without companies, unearthing family secrets, and explaining the economic forces that determine our lives. • Q&A with Author Neal Thompson and 5 Books for Labor Day, Omnivoracious, Aug. 28, 2014. • HuffPost Live interview with me, John and Doug Bassett and displaced Illinois worker, by Martinsville native Nancy Redd, August 27, 2014. • Reader discussion on Reddit’s Ask Me Anything, Aug. 28, 2014. • ‘Factory Man’ explores human side of how globalization affects U.S. industry,’ by Jeffrey Brown, PBS NewsHour, aired Aug. 20, 2014. • Q&A, Associated Press, by Christopher S. Rugaber, “How One U.S. 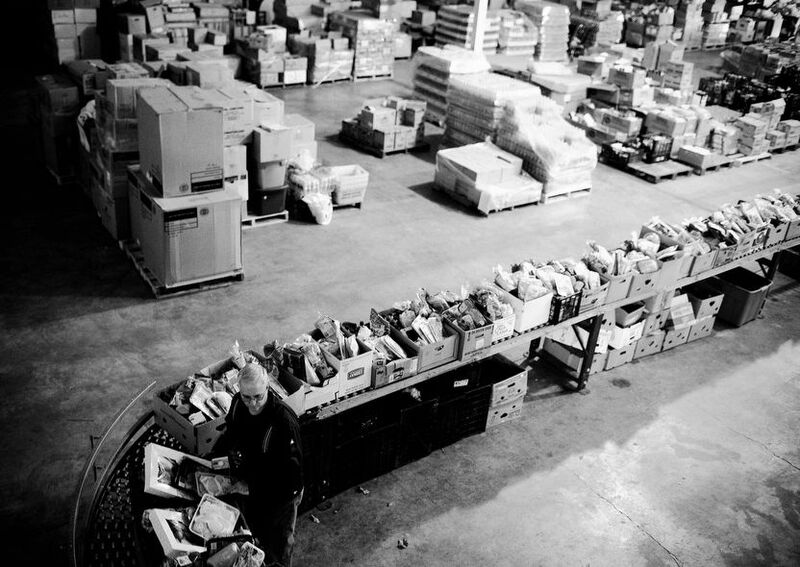 Factory Owner Fought Cheap Imports,” Aug. 19, 2014. • Minnesota Public Radio, interview, “Beth Macy on ‘Factory Man,’ industrial globalization, Aug. 19, 2014. • “Book Discussion on ‘Factory Man,’ “ C-Span2, “BookTV,” first airing Aug. 17, 2014, with John Bassett III, taped at St. John’s Episcopal Church reading/discussion on August 5. • “And the Factory Girl,” WVTF interview with Tab O’Neal, Aug. 14, 2014. • WYSO, interview with Vick Mickunas, Aug. 17, 2014. • Slate (excerpt, Chapter 12), “How Asian Companies Took over the U.S. Furniture Market — Before One Virginia Man Fought Back,” Slate, July 28, 2014. 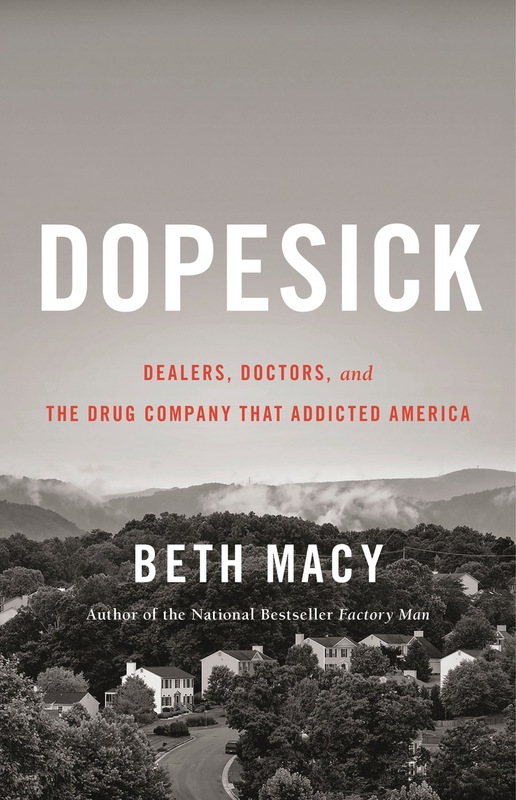 • “Inside the List,” July 25, 2014, “Broken Furniture,” The New York Times Book Review: Beth Macy’s “Factory Man,” about the decline of the American furniture industry and the efforts of one man to bring it back, enters the hardcover nonfiction list at No. 10. Macy appeared on NPR’s “Fresh Air” recently to promote the book, and cited the town of Martinsville, Va., to illustrate how bad things had gotten. • The Tavis Smiley Show on PRI, posted July 25, 2014. • The Leonard Lopate Show, July 17, 2014. • “Author to Author: Lee Smith asks Beth Macy about Factory Man,” The Daily South, SouthernLiving.com, July 15, 2014, wherein I get interviewed by the first Southern writer whose work I fell deeply in love with. • “Factory Man by Beth Macy,” Q&A with my great friend and former editor (a really awesome one!) Madelyn Rosenberg, July 15, 2014. 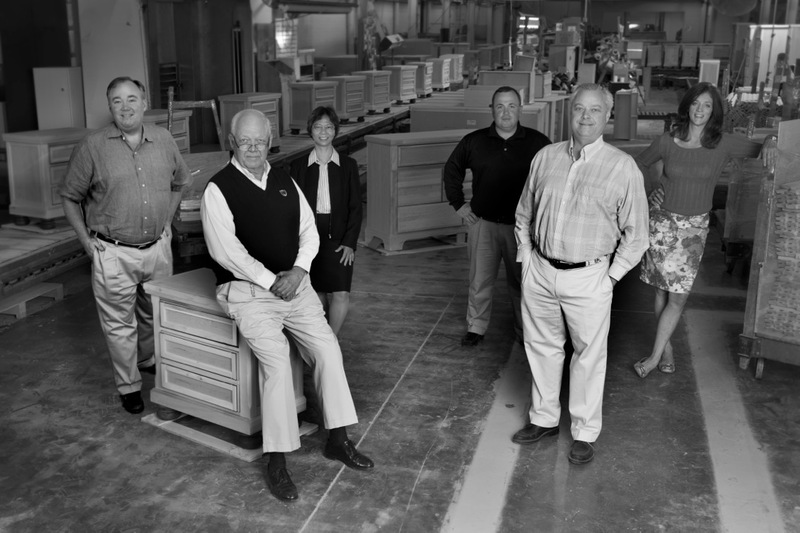 • “‘Factory Man’: How John Bassett III Fought for His Furniture Business,” an adaptation from Chapter One of “Factory Man” published in The Wall Street Journal blog, July 15, 2014. • “A Tale of Two Furniture Towns,” by Beth Macy and Jared Soares, The NewYorker.com, July 10, 2014. 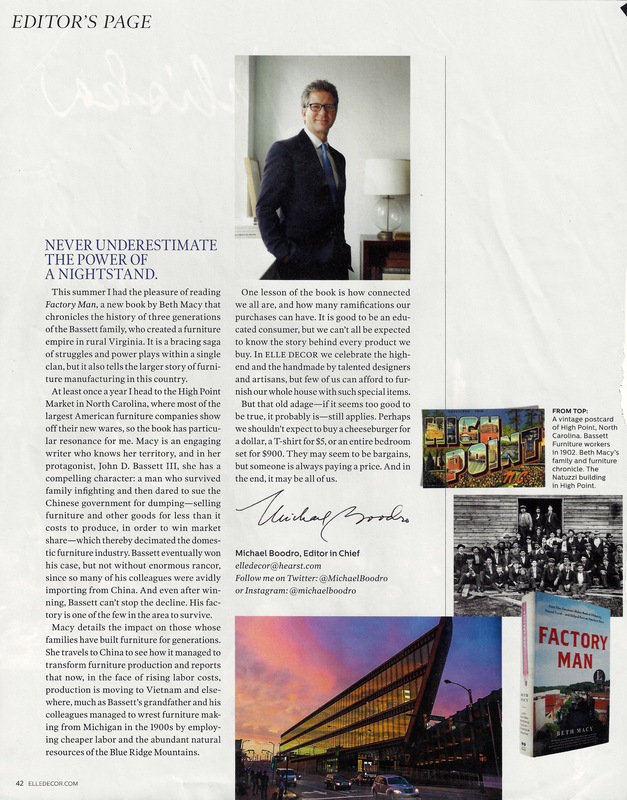 • “Portrait of a Furniture Maverick,” by Pat Kimbrough, High Point Enterprise, July 11, 2014. • Q & A with Diane Molleson of Publishers Weekly, about the complexity of race issues, the return of American manufacturing and how I came to write “Factory Man,” May 5, 2014. • Q & A with Ochberg Society of Journalism and Trauma, on Robert Caro’s “time equals truth,” and coaxing reluctant sources to open up, by Sarah Kess, February, 2014. • Harvard Kennedy School essay on FACTORY MAN, “America, Decoupled,” by Brian Chiglinsky, Kennedy School Review, October, 2013. • Why and how the national media missed the big story of globalization — its aftereffects, published in Acts of Witness, October 2013. • Talking Biz, Q&A with Chris Roush, “Turning a Business Feature Into a Book,” October 2013. • “Beth Macy Talks Upcoming Book on Globalization,” by Mary Ogilvie, The Daily Collegian, Penn State University, Oct. 3, 2013.